The 2017 Dodge Construction Outlook predicts that total U.S. construction starts will advance 5 percent to $713 billion, following gains of 11 percent in 2015 and an estimated 1 percent this past year. Project gains of 8 percent for both residential and nonresidential building will be offset by an expected 3 percent drop in nonbuilding construction. A Florida market rebound is evident in downtown Miami. Among projects leading the charge is the 700-ft. Paramount residential tower, the first phase of the mixed use Miami Worldcenter. Supermix Inc. dispatched 1,300 loads of ready mixed concrete for the October 2016 foundation pour. The Dodge Data & Analytics forecast sees overall multifamily project activity in 2017 gradually falling back from 2015 peak levels. “The U.S. construction industry witnessed signs of deceleration in 2016, following several years of steady growth,” says Dodge Data & Analytics Chief Economics Robert Murray. “Total construction starts during the first half lagged behind what was reported in 2015, raising some concern that the construction expansion may have run its course. Commercial building activity is projected to climb 6 percent in 2017, following a double-digit gain last year. The 105,000-sq.-ft. Truck Country Freightliner Service Center in Deforest, Wis., came together in 2016 on the strength of 21,500 sq. ft. of hollow core plank from County Materials and 33,000 sq. ft. of panels from Mid-States Concrete Industries. CRH investor guidance for 2016 and beyond shows key building and nonbuilding sector market peaks in relation to near-term prospects for Oldcastle Materials, Architectural and Precast operations. Single family housing will rise 12 percent in dollars, corresponding to a 9 percent increase in units to 795,000 (Dodge basis). Access to home mortgage loans is improving, and some of the caution exercised by potential homebuyers will ease with continued employment growth and low mortgage rates. Older members of the Millennial generation are now moving into the 30- to 35-year-old age bracket, which should begin to lift demand for single family housing. Multifamily housing will be flat in dollars and down 2 percent in units to 435,000 (Dodge basis). This project type now appears to have peaked in 2015, lifted in particular by an exceptional amount of activity in the metro New York area, which is now settling back. Continued growth for multifamily housing in other metropolitan areas, along with still generally healthy market fundamentals, will enable the retreat at the national level to stay gradual. Commercial building will increase 6 percent on top of the 12 percent gain estimated for 2016. Office construction is showing improvement from very low levels, lifted by the start of several signature office towers and broad development efforts in downtown markets. Store construction should show some improvement from a very subdued 2016, and warehouses will register further growth. Hotel construction, while still healthy, will begin to retreat after a strong 2016. Institutional building will advance 10 percent, resuming its expansion after pausing in 2015 and 2016. The educational facilities category is seeing an increasing amount of K-12 school construction, supported by the passage of recent school construction bond measures. More growth is expected for the amusement category (convention centers, sports arenas, casinos) and transportation terminals. Manufacturing plant construction will increase 6 percent, beginning to recover after steep declines in 2015 and 2016 that reflected pullback of large petrochemical plant starts. Public works construction will improve 6 percent, regaining upward momentum after slipping 3 percent in 2016. Highways and bridges will derive support from the new federal transportation bill, while environmental works should benefit from the expected passage of the Water Resources Development Act. Natural gas and oil pipeline projects are expected to stay close to the 2016 volume. Electric utilities and gas plants will fall another 29 percent after the 26 percent decline in 2016. The lift that had been present in 2015 from new liquefied natural gas export terminals continues to dissipate. Power plant construction, which was supported in 2016 by the extension of investment tax credits, will ease back as new generating capacity comes on line. The 2017 Dodge Construction Outlook was presented at the 78th annual Outlook Executive Conference held by Dodge Data & Analytics at the Gaylord National Resort and Convention Center in National Harbor, Md. Copies of the report with additional details by building sector can be ordered at www.analyticsstore.construction.com. 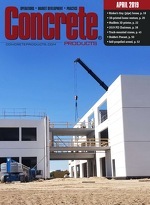 Demand for precast concrete water, wastewater and waste-handling products—septic tanks, manholes, supply and conveyance components, grease interceptors, hazardous material containers, among them—is projected to rise 5.1 percent per year to $1.2 billion in 2020, a new report from Cleveland market researcher Freedonia Group finds.